Homework is definitely something that is hard for a lot of families. We know how much of a burden it can be. We, as educational therapists, have to maintain clear boundaries on homework. We are not homework helpers. We are not homework coaches. We teach skills and strategies. If needed, refer back to blog 00 in order to better understand how education therapy is different from tutoring. We justify the discussion of homework in our world as ET’s because it’s all the other parts of homework that we work on. It’s strategy, approach, how to handle a difficult concept, grit, time management, prioritization, task initiation, project management, etc. It is never about completing homework in session but rather managing homework, stress, approach, and efficiency. We have a lot of opinions when it comes to homework. We strongly believe that kids should be able to be kids. We do not want to delve into the debate of whether or not homework is a good idea. Regardless of the various arguments about the benefits of homework, it is a reality that homework is a part of the vast majority of student lives and something that we (parents, educational therapists, and teachers) have to teach our students to manage. We know how hard homework time can be in your household. We know how stressful it can be when your child is not doing their homework the way that you think they should be doing it. It can be stressful when your child is either not getting it done at all or not turning it in. Or when they are doing it incorrectly. There are so many different aspects of homework but we are going to give a generalization about how to help you get through homework time. There are various things that homework should be. For starters, homework should be a reinforcement of concepts. There are a lot of schools that do the flip model of having the students learn the material at home and then do homework in school. However, most students attend traditional schools where they are learning the material at school with their teachers and doing the reinforcement piece at home in the form of homework. In elementary school, there is reading, writing, and math homework. In middle school, there is homework that is due on different days and more long-term assignments or projects. (Be sure to refer back to blog 02 where we discuss how to calendar in order to better understand how to manage homework!) How it is managed will vary depending on the age group of the student. The daily struggle of homework involves creating time. After school time can be a battle for students. Most of the time, kids come home from school and do not want to start on their homework right away because they are just burnt out from the day. This can lead to a big fight between you and your child and the rest of the time after school becomes about getting homework done rather than family/quality time. Most students who struggle in school actually work twice as hard as their peers to produce half as much. It is important to remember that your child is not defying you in particular. Starting their homework and getting it done is very hard for them. Their day is so long while they are at school. If you were to break down how many daily transitions, projects, concepts, ideas, and responsibilities students manage in school, you would very likely see that it is a lot more than we have as adults and working professionals. Plus these kids are also dealing with situations beyond the classroom such as learning how to navigate social relationships and who they are as little people, and figuring out what they like. All of it is exhausting and it plays into why they are avoiding homework. Homework can remove the love for learning for a lot of students. This is heartbreaking for us, parents and teachers. That is why we do everything we can to preserve that love for learning. One of the frequently asked questions we get asked is how long homework should take. Here is the simple answer: if homework takes hours when it shouldn’t, there is a problem. What is developmentally appropriate for a second grader is not taking two hours to complete homework every night. However, a high schooler should be doing two hours of homework every night. Therefore, you must take into account how old your kid is and what is developmentally appropriate for them. This means being aware of what is developmentally appropriate for your child specifically, not for their chronological age group. You might have a ten-year-old, but where they are developmentally is closer to a seven or eight year old. That needs to be taken into account. We only want to hold our children to the level they are currently. Often the students that come to us for help have an area of challenge in math. This brings up an issue we have with drill and kill math assignments. When it comes to the subject of math, it is so critical that students understand concepts. So, why are fifty of the same type of problem being assigned? You really have to be mindful of what the reason behind the assignment is. This brings us to a point that might be controversial for some of you but we hope that it can help you to reframe the area of struggle in your household. If your student is spending three hours a night completing math homework, and there are tears and fighting about it, cut them off. Nothing will happen if they don’t complete the assignment. Are we really worried about the grades of an elementary aged student? Or even a middle school student? Of course there are exceptions when it comes to private schools and we do acknowledge that element. However, if you are trying to get into a middle school or high school in a private school setting, this is a conversation with your child’s teacher about what is happening at home. Our ultimate need as educational therapists is our desire to really preserve a child’s love of learning and three hours of math homework does nothing to help. When your relationship with your child becomes all about their struggle with homework you must take a moment to decide what is really important. Is your child’s happiness more important than the fact that they have fifty addition and subtraction problems when they are in first grade? Try to put this into perspective because it really is not about what your child can and can not do when it comes to fifty addition and subtraction problems. It really is about helping them to be successful. This might include setting a goal of a certain amount of problems that is appropriate for them. In the end, you are the parent and we are empowering you to make these decisions. We are not telling you to wash your hands of the homework and just forget it. Rather, we hope parents make decisions and choices based off what is reasonable for their child. With older students, a common homework issue is that the student is starting homework at 9:00 PM. There is an ideal time to start homework (and it’s not 9 PM). As an example, let’s think of a car. When it is really cold outside and you start your car, you usually leave the engine running for a moment in order to let your car warm up. How much longer does it take for the engine to warm up in order to get driving? This is the same concept as after school. If you wait a really long time between when you get out of school and when you start your homework, it is like you are starting all over again and your brain has to warm up. If a student is beginning assignments at 9:00 PM they are most likely not getting to bed until 11:00 pm and that does not leave enough sleep time for any student who is waking up super early for school. The pattern of a 9:00 PM start time tends to be common amongst students with ADHD. They wait for the sense of urgency that arises when they realize that they should be going to bed soon but they still have things that need to get done. Ideally, you want to create that feeling earlier in the day. That requires parents setting a cut off time for homework and whatever does not get done by that time does not get done at all. (This tends to work better for kids who are still intrinsically motivated.) It really requires that the child fully believes and understands that after a certain time, there is no more homework in the household. This will create a more healthy and appropriate sense of urgency for the student. Of course, this approach requires that parents are okay with things potentially not getting done. There might be a couple of times where you as the parent insist on an 8:00 PM cutoff and your child will feel the natural consequences of their choices. However, with consistency and boundaries, your child will be able to adjust to an earlier start time. It is all about the follow through. With any behavior plan or with any family structure, if you decide that you are going to do something you must stick to it in order for it to be effective. As we give various ideas and strategies for dealing with homework please keep in mind that you should not be trying all of them at once. It will not work. You need to pick a strategy that makes the most sense for the problem that is bugging you the most. Pick the problem that is most urgent in your household and assess that one. If there are several problems, use a triage approach. Decide which issues are minor and which are more important and need to be dealt with first. If the main problem for you is that your child refuses to start homework before 9:00 PM, then creating and shifting the sense of urgency for your child will definitely be a game changer for you. We must take the time to consider the working parents in our audience. Not all parents are going to be present during homework time. In this case, there usually is an adult who is with your child during the afterschool hours. You as the parent must empower the adult and teach them how you want things to be done. Inform them of the rules, boundaries, and structures you want to be set. This is a great opportunity to incentivize your child which requires finding out what your child’s currency is. What is your child willing to work for? Depending on the age, gender, and developmental stage, your child’s currency can be anything from an eraser or sticker to points in a (very simple) point system that leads to a reward. You know your child best so make sure that what you choose aligns with what works for you as a family. As we discuss incentivizing your child, what we are really focusing on is preserving family time. As a working parent, you do not want to come home and do homework with your kid. You are done with your work day and the ideal scenario is that your child would be done with theirs as well. When it comes to flat-out refusals and meltdowns from a student in regards to their homework…there are a few examples that can be used to define refusals. There are kids that don’t want to try because it feels too hard for them. They shut down, won’t do it, and say that they can’t. It is a case of learned helplessness. They are not refusing to do their homework to defy you as the parent or to defy their teachers. They simply do not want to try because it feels too hard. Going back to the concept of incentivizing the child, it’s about thinking of ways that will work. It is about helping your child break down the homework, figuring out what is reasonable for them and setting proper goals. If they do one page or one section, that could be a win. It may not necessarily feel like that could be a win because you still have three more pages but if you continue to build on success, your child is more willing to do more. Once they see that they actually can do it they become motivated. Our mantra is to start small. You don’t learn a new concept in math with four or five figures. You learn a new concept with single digit numbers because it is not about the computation, it is about how you approach the task and understand the concept itself. Then you build on the skill. Success will breed success. You get to define what that looks like in your family. Remember that there are different strategies to consider that might work for you or your child to make sure that you are able to get through it when it becomes hard. We sometimes like to build in little breaks for kids. Or, for kids who get really frustrated, we talk about breathing and do a breathing exercise. We also might have them draw something on a piece of paper for a few minutes or jump on the trampoline for a few minutes. There are so many ways to help your child get their stress out when things become too intense. Think about how you can prevent a meltdown before it happens by using a coping strategy. There is nothing wrong with melting down; it is our job to teach our children how to rebound after a meltdown. We also want to make sure we talk about the right set of circumstances to make homework happen. The first tip is to have an extra set of books at home. If your child is in middle school or high school, they are carrying various big books around and they often forget which ones they need to take home. It is very frustrating to have homework and not have the right materials for it. Having an extra set of books at home will alleviate that potential stress. You can also have a digital copy of books. The second tip is to get homework in advance. This is particularly for little ones. If you can get the spelling packet on Friday, before the weekend, you can start practicing so that it all does not have to get pushed into just a few days. Especially in those short weeks when the teacher decides that even though you are out of school on Wednesday they are still giving a spelling packet out on Monday. You are going to want those extra couple of days to spread it out and have a strategy about how you are going to approach it. This really does require you to know how to partner with your child’s teacher. If your child habitually does not bring home the right material, talk to your child’s teacher about emailing you assignments or having your child take a picture of the assignments if they are old enough to have a phone. Another tip is to keep a clean workspace. When a child does not have a place at home for them to do their homework they wind up doing it on their beds, on the couch, or in a cluttered area with other stuff going on. It is really important to have a clean workspace. Organize a specific area for homework time. Have a desk where materials are organized and your child always knows where everything is. Before you can have a clear mind, you must have a clean physical space around you. Another tip for your middle school and high school students is to have a list with the phone numbers of your student’s friends, etc. That way if your child forgets something they can have someone to text or call to find out what they need to know. We encourage students to get at least two phone numbers from two people in every class. Digging further into a point we previously mentioned: it is important to partner up with your child’s teacher. When going about this, please remember that teachers have a lot on their plate. If you are able to take a step back and look through the lens of the teacher and acknowledge how much they do, it will be appreciated. Appreciation becomes reciprocal as you become aware and show gratitude. The language we are using is fairly significant. We are using the word partner. Partner implies that there is collaboration on both ends. We both have experience being classroom teachers in our past. We promise that if you as the parent communicate from an understanding perspective, it really makes the teacher more inclined to work with you. You want the partnership. You want a healthy relationship. The second thing to consider is making sure that you are having a talk with your student’s teacher at a convenient time. That means you are clear with the teacher about what you are going to talk about. We have never sent an email to a parent requesting a conversation without telling them what we want to talk about. This is very important. Nobody likes getting an email saying, “We need to talk.” Getting a message like that is anxiety producing! Asking for help is the way to go. Be aware of how you are approaching the situation and apply respectful behavior. This also leads to always saying thank you. After you have had a conversation with the teacher, a simple email thanking them for their time can go a long way. It will make them more inclined to partner with you. Be mindful of how you are coming across. Of course, a lot of what we are saying is very much common sense. Tutors can be a huge help and then they can turn into a hindrance. We want to be very mindful about how we are using tutors. This is an ongoing conversation we have with a lot of clients. Although tutors are helpful in a million ways, there comes a point where they can become a crutch. There might be a point where we are teaching dependence rather than independence. You want to be careful and aware of when this shift happens. It can be difficult to sense when this is happening. Tutors do not have the same mindset as educational therapists. They are not trying to work themselves out of a job whereas educational therapists are trying to work ourselves out of a job. We want the students we work with to eventually not need us anymore. ” We want our students to, in a sense, struggle for a little so that they can ultimately thrive. Homework shouldn’t be perfect. Do not correct it for your child. Do not sit there and make your child correct it themselves. Eighty percent correct is considered mastery and your child’s teacher needs to know where your child is at, realistically. If your child is coming into the classroom with perfect homework, your child’s teacher is assuming that they have mastered it and there is nothing else that they need to do as far as reinforcement. However, if your child is going into the classroom with homework that they have actually completed themselves…it is going to help them on so many different levels. It is helping to inform the teacher and it is also helping them learn and figure out not only what they are doing wrong but also how to correct it. You want your child to seek out how they are going to fix things when they don’t understand them, not just to be told. Keep in mind, we are not saying that you should not check your child’s homework. We are saying don’t correct it. We both are educators and we come at homework in a very different perspective than a lot of other people do. We hope that by providing our insights on homework we have helped you to shift how you think about it. We hope you can see homework in a different light and feel more comfortable when it comes to dealing with the task in your household. As always you can connect with us on our Instagram @LearnSmarterPodcast or on one of our personal Instagram accounts, @KappEdTherapy and @MyEdTherapist, or you can see us on Facebook in the Smarties of the Learn Smarter Podcast group. If you want to have a conversation about homework and what to specifically target with your child first don’t hesitate to book a strategy session which you can do by clicking the “Work with Us” link on our website. Homework is absolutely the most dreaded time of day for the families and students of Rachel & Steph. In this episode, Rachel & Steph talk about what the goals of homework SHOULD be, what it often becomes and what to do to reclaim control over this time of day in your home. 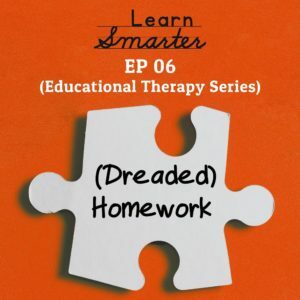 They discuss what to do when “20-minute homework” takes 2 hours, how to create the right environment for homework to happen, the working parent struggle and homework refusal. Also, Rachel & Steph give you their ideas on how to partner with your child’s teacher(s) as well as some real-world strategies to help make homework happen.